Gina says this Crock Pot Sesame Honey Chicken has the perfect balance of sweet-savory without too much added sugar. Click for The BEST Instant Pot and Slow Cooker Teriyaki Chicken Recipes! I know we’ve been focusing on Slow Cooker Summer Dinners lately, but it won’t be long before kids will be going back to school. This Crock Pot Sesame Honey Chicken from Skinnytaste would make a perfect school-night dinner, and it cooks in 3-4 hours so it’s perfect for those days when don’t think about dinner until mid-afternoon! 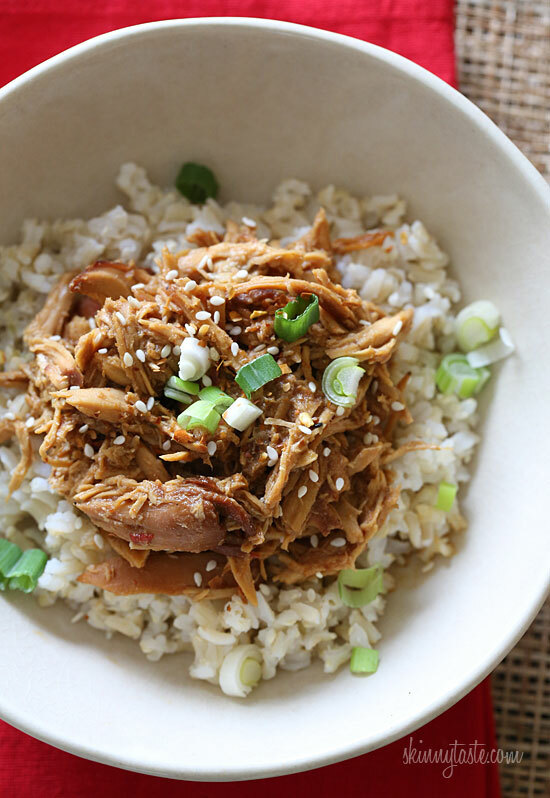 Shredded chicken with some type of Asian sauce is becoming a classic slow cooker meal. Gina says she’s not a fan of sweet food for a main dish, so this recipe has a lot of spicy and savory flavors to balance the sweetness. Get the complete recipe for Crock Pot Sesame Honey Chicken from Skinnytaste. Gina used a Hamilton Beach Six-Quart Programmable Slow Cooker for this recipe. Use the index page for Chicken Recipes to see more ideas for chicken in the slow cooker or pressure Cooker. Sesame chicken is my grandson's favorite take-out dish. I'm going to teach him how to make this so he can have it more often! Lydia, that sounds like fun! I am intrigued by some of the ingredients Gina used, like the little touch of tomato sauce.